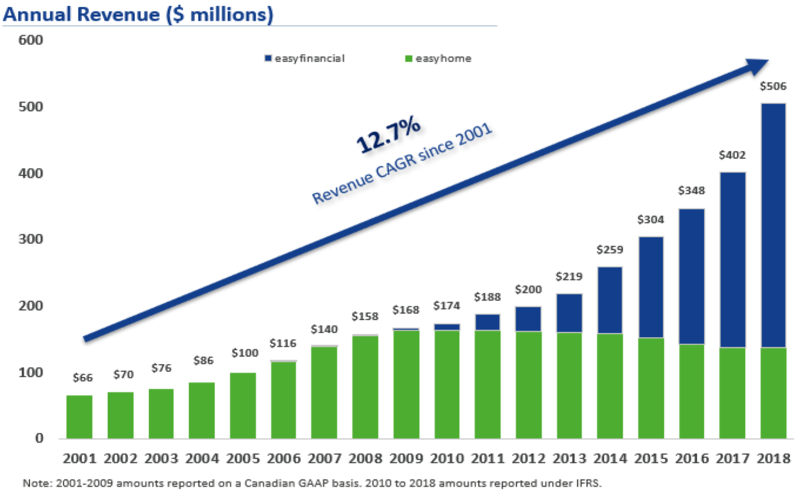 goeasy Ltd. (TSX: GSY) offers leasing and lending services in the alternative financial services market and provides everyday Canadians a path to a better tomorrow, today. goeasy Ltd. serves its customers through two key operating divisions, easyfinancial and easyhome. easyfinancial is a non-prime consumer lender that bridges the gap between traditional financial institutions and payday loans. easyfinancial offers a range of unsecured and secured personal instalment loans supported by a strong central credit adjudication process and industry leading risk analytics. easyhome is Canada's largest lease-to-own company, offering brand-name household furniture, appliances and electronics to consumers under flexible weekly or monthly leasing agreements through both corporate and franchise stores. Both operating divisions are supported by an omni channel business model that includes a national footprint of over 400 branches and stores across Canada and digital eCommerce enabled platforms. goeasy funds its business through a combination of equity and debt instruments. Common shares are listed for trading on the TSX under the trading symbol “GSY” and goeasy’s convertible debentures are traded on the TSX under the trading symbol “GSY-DB”. The Company has been able to consistently secure additional capital at increasingly lower rates in order to continue fueling the growth of its business and has sufficient capital and borrowing capacity to meet its growth plans through the third quarter of 2020. goeasy is rated BB- with a stable trend from S&P, and Ba3 with a stable trend from Moody’s. easyfinancial is the Company’s financial services arm that provides installment loans to non-prime customers who have limited access to traditional bank financing products. easyfinancial’s product offering consists of unsecured and real estate secured installment loans form $500-$35,000 at interest rates starting at 19.99%, with repayment terms of 9 to 60 months for unsecured loans and up to 10 years for secured loans. Products include unsecured and secured installment loans that range in size from $500 to $35,000 with interest rates starting at 19.99% and repayment terms of 9 to 60 months for unsecured loans and terms of up to 10 years for secured loans. Omni-channel model that enables customers to transact through multiple delivery channels including a National branch network of over 240 locations, online via a digital application platform, through call centers and through an indirect channel that provides loan products to consumers at the point-of-sale of third party merchants. Centralized loan decisioning process that uses leading-edge, data-driven modeling and analytical techniques that include underwriting and credit adjudication policies that have been continuously enhanced by analyzing over $2.9 Billion in origination data. easyhome is Canada's largest lease-to-own company, offering brand-name household furniture, appliances and electronics to consumers under weekly or monthly leasing agreements through both corporate and franchise stores. easyhome’s programs appeal to a wide variety of consumers who are looking for alternatives to traditional retailers and may not be able to purchase merchandise due to a lack of credit or insufficient cash resources, or may simply want to use the merchandise, with no long-term obligation, before making a purchase decision. In 2017, the Company strengthened its relationships with its easyhome customers by offering them unsecured lending products in almost 100 easyhome leasing locations. This expansion allowed the Company to further increase the distribution footprint of its financial services products and leverage its existing real estate and employee base that understands this customer segment. Oldest segment of goeasy’s business. Leasing transactions that act as an alternative to the financing offered by traditional retailers. Customers with a lack of credit or insufficient cash funds can lease merchandise without credit checks or down payments and the flexibility to terminate a lease at any time with no cost. Fixed annual interest rate of 29.99%. Starting in 2017, almost 100 easyhome locations began offering unsecured loans up to $15,000, powered by easyfinancial to expand the company’s points of distribution and leverage its existing real estate investments.